A Very Rare, Unique, Nicely Made And Well Decorated, Early Coles Creek/Caddoan Crenshaw Double Jar That Exhibits Surface Sheen Aging And Clay Patination, Visible Aged Surface Shell Grog, Correct Motif And Shape For The Type And Area Found, Visible Inside Aging And Extended Ground Placement, Correct Manufacture For The Area Found. Found At The Crenshaw Site And Purchased From The Finder Living Near The Site, By Tommy Goff In 1982. Ex-Tommy Goff, George Heckman, T. Gary Majors Collections. 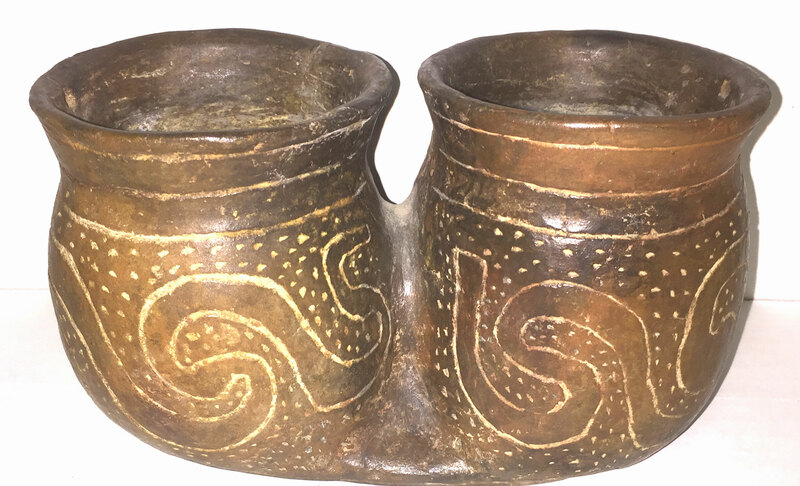 Similar Later Period Caddoan Double Vessels Are Referred To As A Marriage Vessel. Includes A Ken Partain Certificate Of Authenticity.